This route starts from the old capital Corte. The town is worth spending time in especially to visit the old citadel. This route follows the train line to Ajaccio - but don't let that fool you, as the profile shows there's plenty of up and lots of down. It's also the second half of the second stage of the 2013 Tour de France. An alternative is to take a rest stop at the Col de Vizzavona and cycle back to Corte. This is about 65km and takes in all the climbing as well as adding some in for the return journey - four caregorized Tour climbs in a round trip! The climbing starts straight out of Corte with a 7.7km stretch of around 5% to the Col de Belle Granaje. From here there is a fast descent into and through the picturesque and narrow village of Venaco before the road picks up again to climb through Vivario and beyond to the Col de Campo Di Lupo. Just over 6km of about 7% including 1km of between 8-13% after Vivario. After the Col there's 3km of respite before a 6.5km climb through stunning scenary to the Col de Vizzavona which again has a km or so where the gradient is between 8-13%, the maximum gradient on the route. 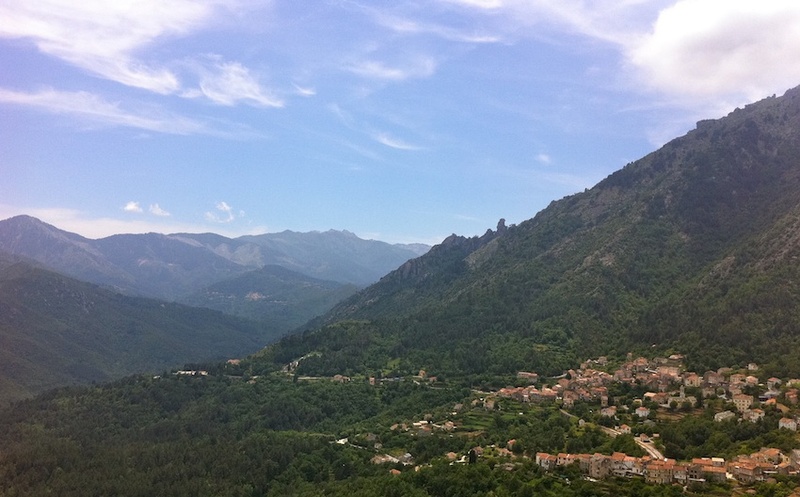 Over the Col and there is a beautiful, very steep and narrow jaw dropping descent back into Corse du sud, following the Gravona valley, and eventually the town and port of Ajaccio. Watch out for livestock as you descend from the Col! This route finishes outside the home of Napoleon Bonaparte but you may well have settled at one of the many waterside cafes before then.